Some days, conditions are such that it is obvious what one should do. 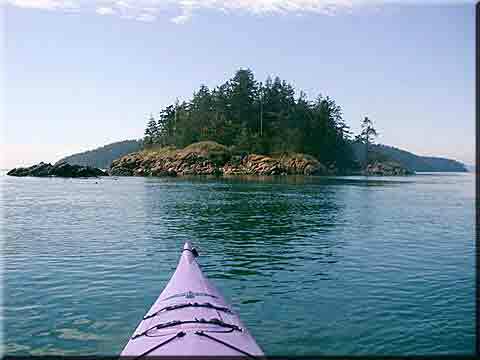 Yesterday was such a day; it was warm, the water was flat, and the San Juan Islands cried out to be explored. I set aside other things, got on my dry suit, and quickly stowed the usual safety gear and water for a day-trip into my 17' Eddyline Raven. I then wheeled it the five blocks to the beach at Tugboat Park in Skyline, Anacortes, WA. The current was ebbing for another hour, so I paddled straight south from the sandy beach, allowing the one knot current to assist me. Soon I was approaching the unnamed island which sits between Burrows Island and Allan Island. It is privately owned, but the one house on the island has rotted away to nothing. Unnamed island between Burrows and Allan Islands. Allan Island is superimposed in the background. 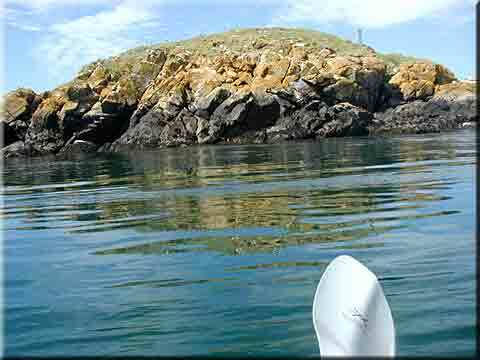 I paddled close alongside Allan Island, a large island owned by Paul Allan, of Microsoft. It has an airstrip on the top, hidden by the trees, and one house original to the property. The only thing unusual is a huge boat dock, and very occasionally one sees a large yacht docked there. 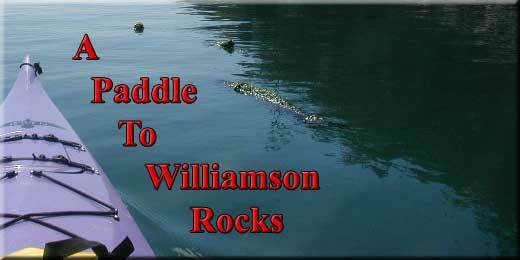 However, my destination was the Williamson Rocks, a bird and seal sanctuary sitting about 3/4 of a mile south of Allan Island. A sign on the island warns boaters to stay 200 yds. away, but one can still see a sizeable seal colony and a variety of birds which roost there. 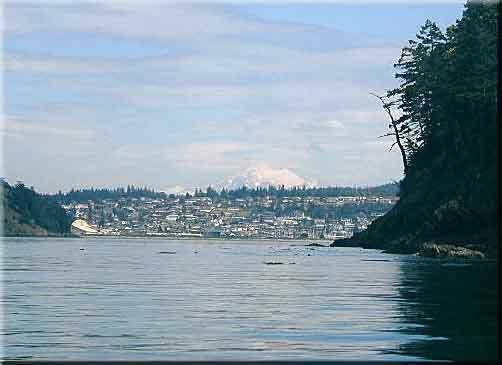 The rocks sit in the junction of Rossario Strait and and the Strait of Juan de Fucca, both sizeable passages which move huge amounts of water in the course of Puget Sound's huge daily tide changes. Even at slack tide, I could see the current boundaries in the water, and watch my bow be swung gently sideways as I crossed a transition. A seal watched me as I approached the rocks, then when I was within about 70 feet, he dove in my direction. Commonly, they come up behind the boat and follow for awhile, but I did not see this one again. Nor did I see any seals at the rocks. It must have been the wrong time of day, or year for them to be there. I did see cormorants and seagulls which tried to outdo one another with squawking as I went by. At other times I have seen bald eagles with their young on such rocks, enjoying the safety from coyotes and other predators. I circled the rocks and then headed north for a buoy well out into Rossario Strait. By now the current was flooding, running north up the strait, and I wanted to get well into it. This is an area where I have seen harbor dolphins and I was not disappointed. They were working the rips where fish often congregate, working singly and spaced widely apart. I saw five of them over the next hour, exposing their prominent dorsal fin and blowing air as they breathed before tipping down for the next dive. As I passed Allan Island on its west side, I had a full view of the lighthouse on the southwest point of Burrows Island. The lighthouse is no longer manned, although the light is still active, powered by solar panels. Burrows Island belongs to the forest service, except for one private home in a small bay on the southeast corner. Boaters and kayakers are free to explore the lighthouse and hike about the island. 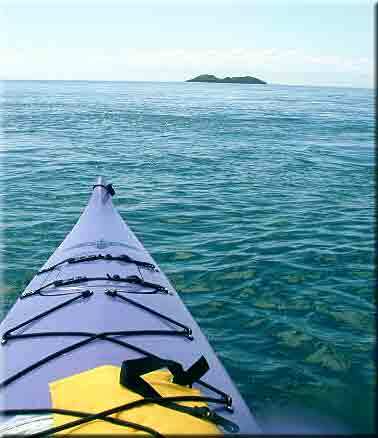 A designated kayak campsite is located on a pebbly beach on the eastern side of Burrows Island. I continued up the west side of Burrows Is. and around to the right into Burrows Strait. I was greeted with a full on view of Mt. Baker sitting squarely above the homes of Skyline. After pausing to take a picture, I hugged the shore and applied a bit of muscle to fight the current which was now coming out of Burrows Bay at about 2 knots. It made for a longish final mile, but eventually I pulled up onto the beach at Tugboat Park and carried the boat up onto the grass and attached the wheels for the walk home. Altogether a pleasant few hours. Mt. Baker, about 60 miles away, sitting above Skyline Marina.